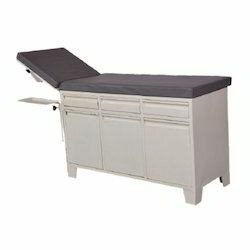 Manufacturer of a wide range of products which include examination couch -motorised or electric, deluxe examination couch, examination couch, examination table, gynae examination table and gynae examination table delux ms.
Keeping the track of latest happening of this domain, we present clients with the superior quality of Motorized Examination Couch. 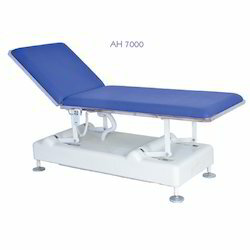 The motorized examination couch is height and backrest electrically operated through handset. 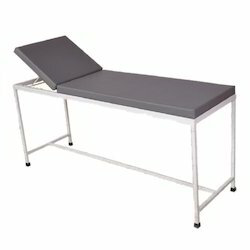 Furthermore, the motorized examination couch consists of two section top made up of stainless steel with mouldy mattress. Leveraging by the vast experience of this domain, we present clients with the premium quality of Deluxe Examination Couch. The deluxe examination couch is known for its backrest movement on ratchet mechanism. In addition to this, the dimension of the deluxe examination couch is 1880 mm length x 610 mm width x 810 mm height. As a noteworthy entity of this domain, we provide clients with the premium quality of Examination Couch. These examination couches is provided with three drawers and three cabinets. 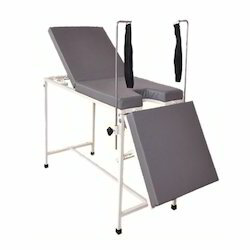 Furthermore, the examination couch is known for its BP apparatus tray. Furthermore, the examination couch is preheated and powder coated. 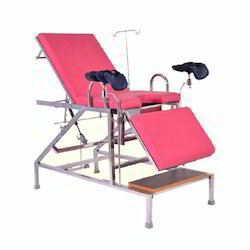 Being a market leader of this domain, we provide clients with the premium quality of Gynae Examination Table Delux SS. 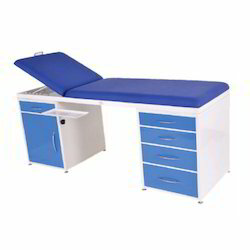 The Gynae examination table delux SS is known for dimension of 1750 mm Length x 660 mm Width x 810 mm Height. These gynae examination table delux SS is provided with U Cut in center part.